The Black-Scholes model can be used to estimate implied volatility. Implied Volatility can be estimated using spot price, strike price, asset price, risk-free rate, time to maturity, and dividend yield. To achieve this, given an actual option value, you have to iterate to find the volatility solution. There are various techniques available; however we will use the Newton-Raphson bisection method. Once Black-Scholes is structured, we use an iterative technique to solve for σ. 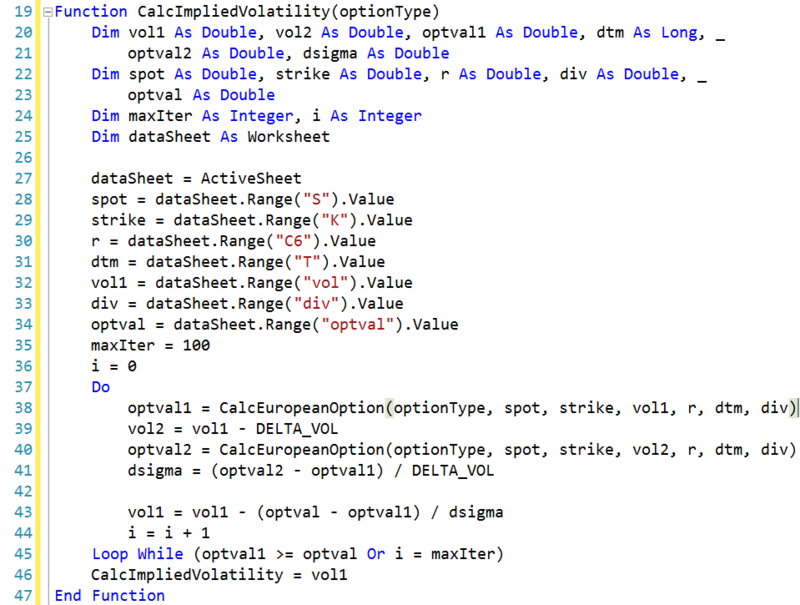 As evident by function name, lines 19 through 47 calculate implied volatility for given input parameters as defined in name range on worksheet. The method iterates till it finds a solution. Precision is defined by constant DELTA_VOL, which is the acceptable error of the function’s result. Since the function iterates to find the correct volatility, setting a higher value can speed execution in a worksheet containing 100 and above instances of this function. Lower values increases the precision. 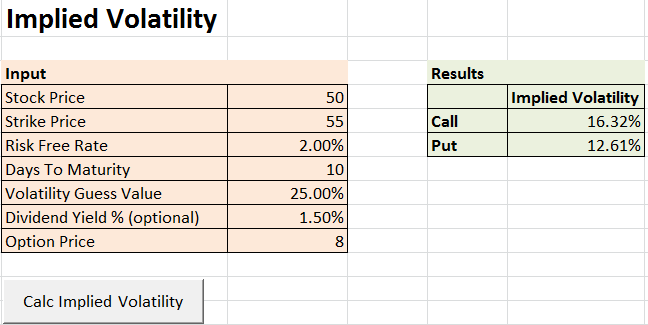 Example: If the exact implied volatility is 16%, setting “Precision” to .05 will cause the function to return a value between 15.95% and 16.05%. The moving average method is a commonly used technical analysis indicator. All moving averages typically use a historical data series and the current price in the calculation. An Exponential Moving Average or EMA assigns a weighting factor to each value in the data series based on its age. The most recent data gets the greatest weight and each price gets a smaller weight as the series is traversed chronologically. 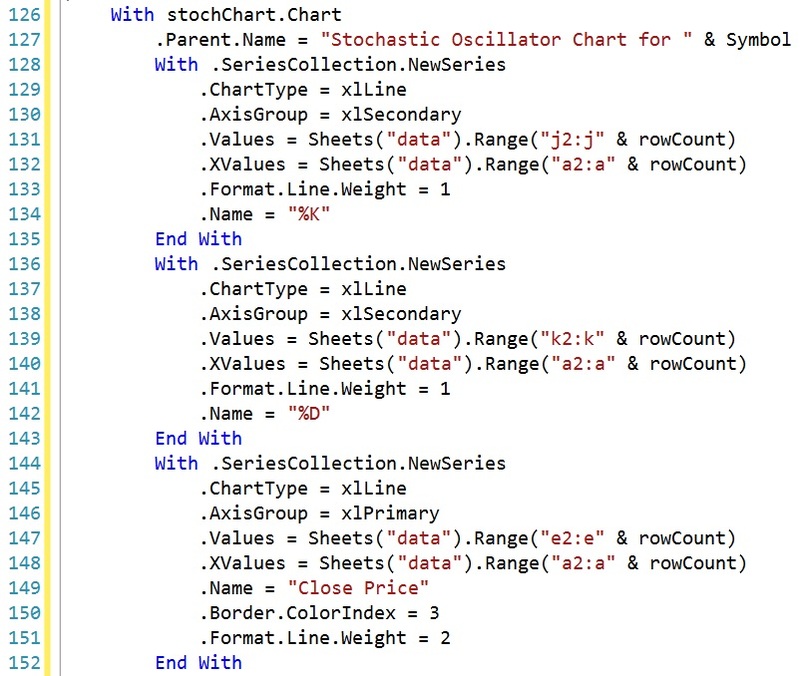 EMA calculation and plotting of chart can be automated with help of VBA. If popularity was the only measurement for risk metrics, the Sharpe ratio would tell us everything we need to know. Unfortunately, Sharpe ratio falls short of covering the full spectrum of risks in the field of investing. 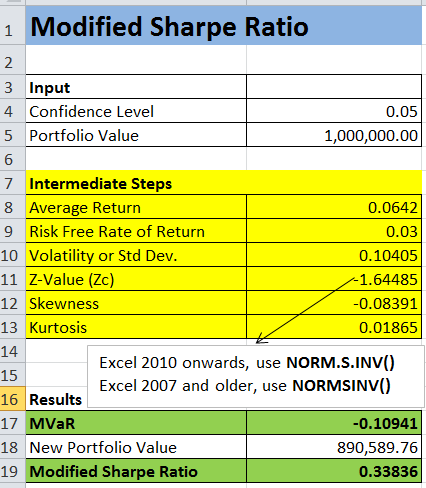 Any discussion on risk-adjusted performance is incomplete without touching on the topic of Sharpe ratio or Reward to Variability which divides the excess return of a portfolio above risk free rate by its standard deviation or volatility. Take for example a portfolio with a 8% risk premium and 25% volatility. The VaR is then roughly equal to 33.25% using a 95% confidence interval (-8 + 1.65*25, Z-value = 1.65 for 95% CI). As per VaR, there is a 95% probability that the losses on the portfolio will be restricted to $332,500 or 33.25% of a $1 million portfolio. We can flip that around and say that there’s a 5% probability that the loss could exceed $332,500. Notice that VaR has limitations, starting with the assumption that the returns are normally distributed. S and K are skewness and kurtosis respectively. 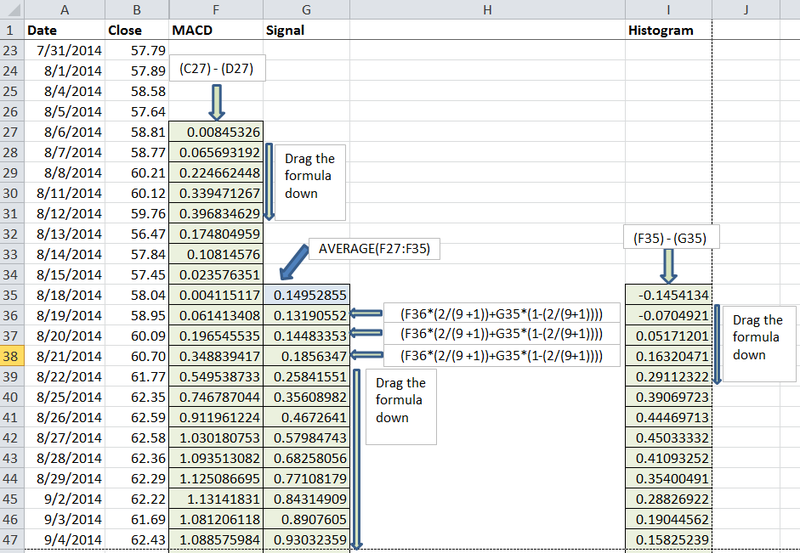 The attached spreadsheet simplifies the calculation for you. It calculates MVaR and Modified Sharpe Ratio once you fill in the annualized portfolio returns, confidence level and portfolio amount. 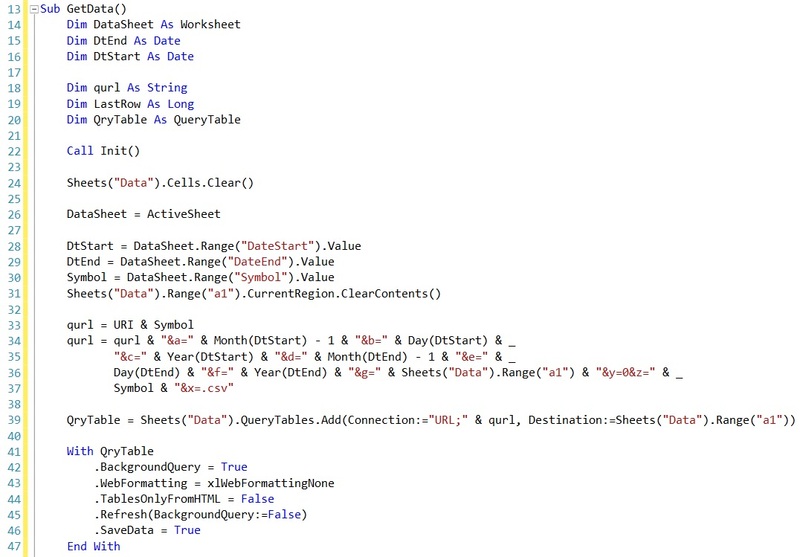 For calculating Z-value, use NORM.S.INV() for Excel 2010 and newer versions. Use NORMSINV() for Excel 2007 and earlier versions. Named after Larry Williams, %R is a technical analysis indicator that shows the current closing price in relation to the high and low for a given look-back period, N. N can be a given number of days, weeks, months, or an intraday time-frame. Williams %R is also referred to as the inverse of the Fast Stochastic Oscillator. In 1987 Larry Williams won the world cup of futures trading turning $100k into over 1.1 million in a span of 12 months. Then in 1997, Michelle Williams, Larry Williams’ daughter won the world cup using the same strategy as her father. Williams %R oscillates between -100 and 0. Generally speaking, values from 0 to -20 indicate overbought condition and values from -80 to -100 indicates an oversold condition. The default setting for Williams %R is 14 trading periods. Take for example that the highest high is 36, the lowest low equals 31 and the close equals 35. The high-low range is 5 (36 – 31), the highest high minus close becomes 1 (36 – 35). The fraction than becomes 1 / 5 equals 0.2. Multiply 0.2 by -100 to get -20 for %R. Low readings (values < -80) means that the stock is trading near its low for the given look back period. High readings (values > -20) means that the stock is trading near its high for the given lookback period. The below screen capture is from the spreadsheet used in this example. Column H and Column I contains the highest high and lowest low of Yahoo for the previous 14 trading days respectively. Column J is where the %R is being calculated using the above equation. The data was imported from Yahoo Finance Web Service for symbol YHOO between the period of Oct-28-2013 and Oct-27-2014. The chart below plots Williams %R vs daily closing price of Yahoo (YHOO) from Oct-27-2013 to Oct-27-2014. The trading oscillator moves between -100 and 0. Notice the chart closely. The YHOO example shows that 14 days Williams %R hitting overbought and oversold levels on regular basis. The stock was overbought from late Nov-2013 to Dec-2013. It dipped below -80 in January, March, April, and late June 2014 giving you a buy signal. The closing price then shot up in August 2014. Keep in mind that overbought prices are not necessarily bearish. Stocks can become overbought and stay overbought during a strong uptrend. Similarly, oversold prices are not necessarily bullish. Closing levels near the bottom of the %R range can signal sustained selling pressure. The VBA behind this spreadsheet calculates Williams %R from historical stock prices and automatically imports from Yahoo Finance Web API. You simply need to plug-in the symbol, from and to dates, and lookback period (defaulted to 14 trading days in this example). 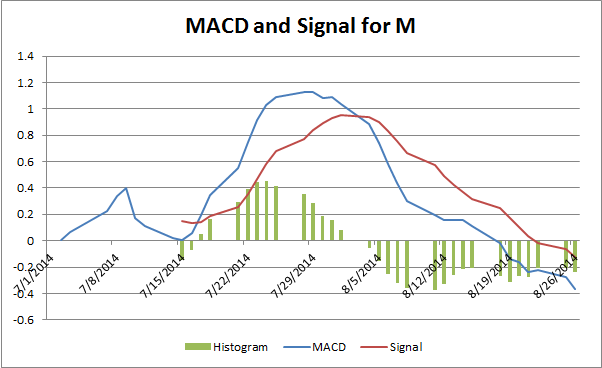 Moving Average Convergence Divergence (MACD) is a popular trend-following momentum indicator. The MACD turns two trend-following indicators, moving averages, into a momentum oscillator by subtracting the longer moving average from the shorter moving average. 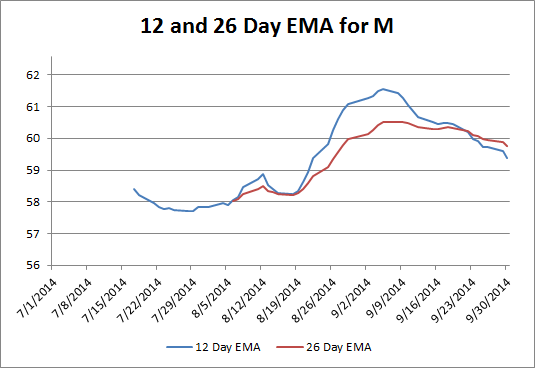 MACD is calculated by taking difference between 12 day Exponential Moving Average (EMA) and 26 day EMA. A positive MACD means the 12-period EMA is above the 26-period EMA. A trigger for buy or sell signals can be obtained when a 9 day EMA called the “signal line” is plotted on top of the MACD. Traders typically use the MACD as a simple crossover, so when the MACD crosses the signal line, they tend to buy or sell based on which way the cross appears.When MACD turns up and crosses over the signal line, bullish crossover occurs. Bearish crossover occurs when MACD turns down below the signal line. The difference between those two values can be plotted by a Histogram. Sharpe ratio is a measure of risk and it is named after Nobel Laureate William F. Sharpe. The Sharpe ratio simply stated is a ratio of return vs risk. Given a set of investment choices, Sharpe ratio can help decide which investment makes the most of your money. It is defined as the ratio between effective return of an investment and its standard deviation. c. Lastly, take the ratio between average of Delta returns and Standard Deviation. This is your Sharpe Ratio. Stochastic or Stoch. Oscillator is a powerful tool for technical analysis that compares a stock’s closing price to its price range over a period. Developed by George C. Lane in the 1950s, the Stochastic Oscillator is a momentum indicator that shows the location of the closing price relative to the high-low range over a given number of trading periods. 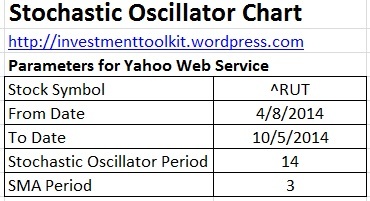 Stochastic Oscillators does banded oscillations that fluctuate above and below two bands signifying extreme price levels. They are helpful for traders in identifying overbought and oversold conditions as the range varies between 0 and 100. It’s sensitivity can be minimized by adjusting the time period or by taking a moving average. 4. %K or Stochastic Oscillator period – The default setting is 14 trading periods, which can be days, weeks, months or intra-day ranges. This is often referred as “lookback” period. %K for 14 day trading period would use the most recent close. %D is a 3-day simple moving average of %K and it is plotted next to %K to identify as a signal line. 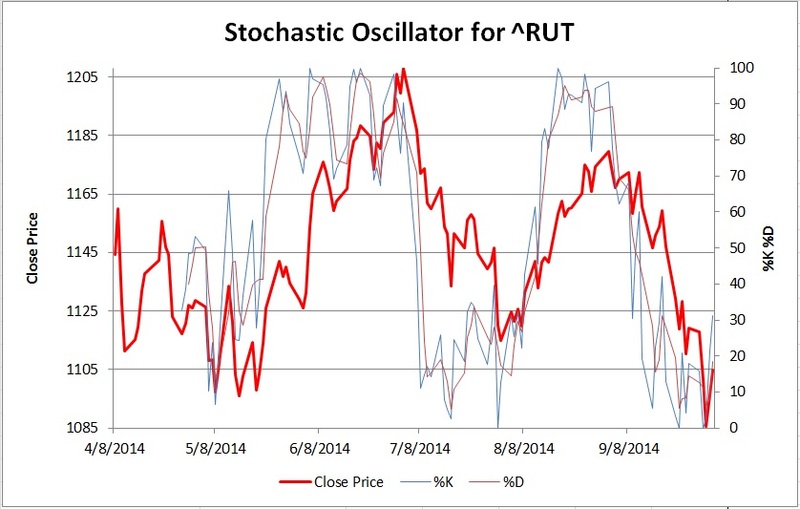 Since the stochastic oscillator is a bound based, you can easily spot overbought and oversold levels. Historically, 80 is considered as overbought threshold and 20 being oversold threshold. Readings above 80 for 14-day Stochastic Oscillator means that the underlying stock was trading near the top of its 14-day high-low range. Readings below 20 means that a stock is trading at the low end of its high-low range. You start off the importing open-high-low-close data for the stock symbol or a major index. VBA downloads historical stock prices using Yahoo Web Service. The worksheet may look as below. Note: few columns have been made hidden for brevity. The above code snippets from line 97 to 118 formulates the calculation inVBA format. Lines 126 through 152 defines primary, secondary and data axes of the chart. Lines 153 through 169 does labeling of axes, sets the scaling sizes, and title of the chart.